Do you want 9mm ammo that can be safely buried in a ditch in your backyard? 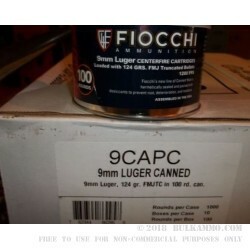 Now you can get it with these 9mm Canned Heat rounds from Fiocchi! Get a literal ammo can from Fiocchi with these 9mm rounds! Packed with 100 rounds of 124 grain full metal jacket bullets, Canned Heat ammunition is an excellent choice for long term storage for ammo supplies. It’s never a bad idea to have some ammo laid up just in case, and these 9mm rounds are a great option for that, because they’re sealed in an airtight container and won’t be exposed to the elements like they would be in some pedestrian cardboard box. Plus, there’s 100 per can, so it’s a more efficient use of space than a regular 50 round box. 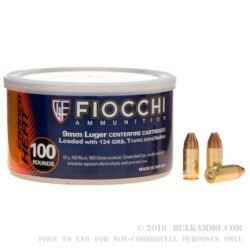 Of course, if you care about shooting then you’ll be please to know that Fiocchi has an excellent reputation for making high quality ammo, and these full metal jacket cartridges definitely fit that bill. The 124 grain bullet is fully jacketed and uses a truncated cone profile which is similar to the shape of many modern jacketed hollow point rounds. That way you can feel confident that if your firearm feeds these rounds, it will feed similarly profiled JHPs. These 124 FMJ rounds are loaded in new brass with non-corrosive primers, which is also a benefit if you plan on storing them for extended periods of time. Q: What's the advantage / result of a truncated cone? A: Several ammo manufacturers state that the truncated cone bullet design aids feeding in some semi autos. Q: What is the storage life on this container? A: If stored properly, the ammunition in this container has the potential to last for decades.